A unique tableted blend of bacteria field tested and proven. 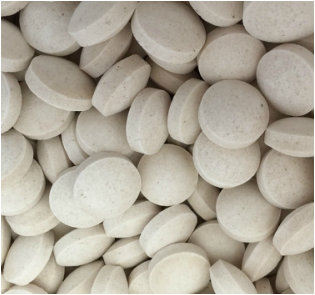 ​PRO4000X tablets contain two strains of Bacillus that have been selected for their innate gene expression resulting in the production of a wide range of enzymes that facilitate their ability to degrade organic material and break ammonia down in aquatic ecosystems. ​Each tablet contains more than 64 billion CFU. Unlike conventional products, no activation is required. The tablets are added to ponds or hatchery tanks where they settle to the bottom, slowly dissolve and the bacteria proliferate. They are in direct contact with the pond sediments and large numbers of bacteria are delivered into a relatively small area. Targeted delivery to problem areas in ponds and canals ensures a more efficient and less costly approach towards managing accumulated metabolites in production systems. ​PRO 4000X comes in two convenient forms. Larger, 16 gram tablets for targeted delivery to problem areas in ponds and smaller 1 gram tablets for low cost wide spread application. Targeted delivery is a very effective way to deliver bacteria to pond bottoms. PRO4000X, in repeat tests has been found to reduce "green" vibrio loads. Click HERE for more information. Belize: Decreased use of electricity due to less water exchange, Improved pond water quality, lower blue-green algae loads, cleaner pond bottoms. For more information click here. India: Altered microbial composition of hatchery tanks, reduction of yellow and green vibrio colonies, reduced loads of potential pathogens in hatchery production systems, increased shrimp growth, and less ammonia accumulation. Satisfied customers in the US, Mexico, Ecuador, Nicaragua, Indonesia, India, Bangladesh, Vietnam and elsewhere. 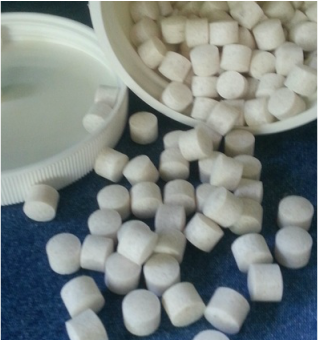 ​For those who prefer powder for pond bottom delivery try our Aquapro EZ product in biodegradable bags.